The new headset allows for chat or music connections through apps like Discord over Bluetooth while also receiving wired audio connections with PC or consoles like PS4, Xbox and Nintendo Switch. SteelSeries announced a brand new headset with some really cool features today. The Arctis 3 Bluetooth headset will allow users to simultaneously connect to a Bluetooth and wired audio source. This is ideal for Nintendo Switch users that have to use the Nintendo smartphone app for voice chat. 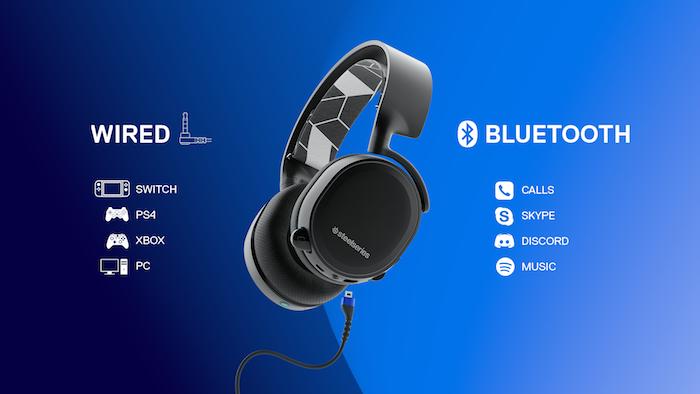 The new headset allows for chat or music connections through apps like Discord over Bluetooth while also receiving wired audio connections with PC or consoles like PS4, Xbox and Nintendo Switch. The Arctis 3 Bluetooth is available now at SteelSeries official website for $129.99.